Integral membrane proteins such as GPCRs, ion channels, and transporters are a large family of proteins responsible for detecting and transmitting extracellular signals into cells and comprise nearly 50% of existing drug targets. Approximately 40% of all membrane proteins contain multiple hydrophobic transmembrane domains, enabling them to span the cell’s lipid bilayer up to two dozen times and adopt complex tertiary and quaternary structures. Monoclonal antibodies (mAbs) against membrane proteins, especially those that recognize conformation-dependent epitopes, are valuable as diagnostic and therapeutic agents because they can bind to critical structures of the receptor that can be exploited for specific detection or functional inhibition. However, the development of such mAbs is especially difficult because most membrane proteins are challenging to express and purify in large quantities, and their extraction from cell membranes often results in loss of native structure. 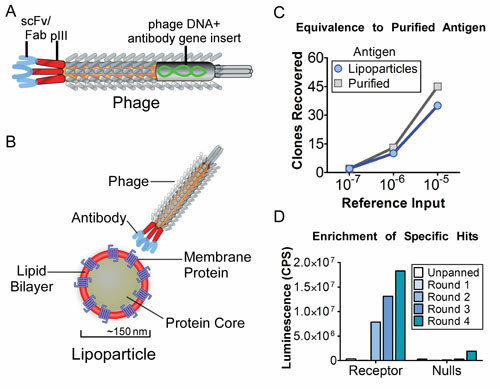 Phage display technology is a powerful approach for isolating human antibodies, where genetically modified phage carrying antibody fragments are used for panning and screening of antibody libraries (Figure 1A). Phage display enables screening of large and diverse antibody libraries (>1010 variants), allows for modifiable in vitro selection conditions for deriving antibodies with specific functionalities, and bypasses immune tolerance limitations, facilitating the selection of affinity reagents against even highly conserved protein targets. However, phage panning with membrane protein antigens presents a unique set of challenges, including a requirement for high concentrations of target proteins that are not easily purified, a propensity for phage to stick nonspecifically to charged lipids and glycoproteins on cell membranes, and the need to retain native membrane protein structures during capture and panning procedures. As a result of these limitations, phage display has largely focused on soluble proteins to date, with less than a dozen phage-derived mAbs in clinical studies targeting unique membrane proteins, nearly all of which are single transmembrane proteins rather than more complex multi-transmembrane proteins. Integral Molecular is combining its Lipoparticle technology with optimized phage protocols to overcome the specific challenges associated with phage display for isolating antibodies against membrane protein targets (Figure 1B). Lipoparticles incorporate high concentrations of properly folded and oriented membrane proteins on their surface, such as specific GPCRs, ion channels, or transporters. Membrane proteins are incorporated on Lipoparticles at concentrations of 50–200 pmol/mg, 10 to 100 fold greater than cells or membrane preparations, providing a highly enriched target for phage clone selection. Lipoparticles are particularly well suited for phage display as they are small (~150 nm), stable, and can be biotinylated, enabling efficient capture to commonly used streptavidin surfaces. Furthermore, Lipoparticles can be made without target receptors (Null Lipoparticles) or from heterologous cell types (human, murine, avian, etc. ), enabling controlled negative selection steps and improved recovery of antigen-specific clones. Conventional phage display protocols have now been optimized with Lipoparticle antigens, resulting in sensitive and specific selection of antibodies directed against membrane protein targets. In a controlled panning experiment comparing a membrane protein antigen on Lipoparticles versus the same antigen in its purified form, similar numbers of reactive clones were recovered, demonstrating equivalent sensitivity between antigen types (Figure 1C). Optimized phage panning with Lipoparticles provides enrichment of target-specific clones, with a round-dependent increase in reactivity and no significant reactivity against Null Lipoparticles (Figure 1D). Optimization of phage display with Lipoparticles is now enabling antibody campaigns against a wide variety of membrane protein classes, including GPCRs, ion channels, transporters, viral envelopes, and other complex multi-transmembrane protein targets. Figure 1. Optimized phage display protocols using Lipoparticles result in high sensitivity detection of specific hits. (A) Phage display takes advantage of the physical linkage of antibody fragments (e.g., scFv or Fab) displayed on the phage coat proteins (pIII shown here) and antibody sequence encoded in the phage genome. (B) Lipoparticles incorporating high concentrations of a target membrane protein in a lipid bilayer are used to isolate reactive phage clones carrying specific antibodies against the desired target. (C) Lipoparticles incorporating a specific membrane protein, or a purified form of that same membrane protein, were used to pan a phage library spiked with dilutions of a reference clone (known to react to the antigen). Using optimized protocols, Lipoparticles recover reactive phage clones to the same extent as purified antigen. (D) Lipoparticles containing a target membrane protein were used to pan a library using optimized protocols. Phage pools from each round of panning were assayed for antigen reactivity by ELISA and demonstrated enrichment of specific hits after two rounds but no reactivity to Null Lipoparticles (which do not contain the target) or with the unpanned library. Integral Molecular and its partners are now using phage display with Lipoparticle technology to isolate specific and functional human antibodies from different types of phage libraries. Phage panning using synthetic or naïve human libraries provides a broad source of antibody diversity, but also requires increased panning sensitivity to recover the small numbers of reactive phage clones represented in each library. Using Lipoparticles and optimized protocols, a naïve library was panned for antibodies against the seven-transmembrane GPCR CXCR4. A large number of individual phage clones was isolated, each showing specific reactivity against the membrane protein target and little to no reactivity against Null Lipoparticles (Figure 2A). Successful isolation of reactive clones from a naïve library demonstrates the utility of Lipoparticles for providing not only sufficient antigen concentration but also optimized sensitivity. To isolate reactive mAbs against a viral target, Lipoparticles containing a viral Envelope protein were used to pan an enriched phage library derived from B cells of infected patients. A large panel of individual phage clones was isolated, each clone showing strong and specific reactivity to the viral Envelope protein (Figure 2B, left panel). Several of the mAbs isolated were capable of strongly neutralizing infection of target cells at sub-nanomolar concentrations (IC50 <0.1 μg/mL) (Figure 2B, right panel). Because membrane proteins retain their native conformation in Lipoparticles, panning with Lipoparticles increases the likelihood of recovering functional antibodies that can be further developed as therapeutic candidates. Lipoparticle technology, offering high concentrations of native membrane protein antigens, biotinylated formats for easy capture, and optimized protocols for use with diverse phage libraries, enables sensitive and specific detection of reactive antibodies against membrane protein targets. Lipoparticles expand the application of phage technology to this large class of underexploited targets for therapeutic mAb development. Figure 2. Lipoparticle panning of naïve and enriched phage libraries results in the isolation of reactive and functional mAbs against membrane protein targets. (A) Lipoparticles containing the GPCR CXCR4 were used to pan a naïve library using optimized protocols. Individual phage clones were isolated and tested by ELISA for specific reactivity against CXCR4. (B) A panel of highly reactive mAbs with specificity against a viral Envelope protein was isolated from an enriched library using Lipoparticles. Unique antibodies with signal-to-noise of >10 were chosen for further characterization from initial phage isolates (left panel). Several mAbs demonstrate sub-nanomolar neutralizing activity against virus infection (right panel). Eli Berdougo, Ph.D. (eberdougo@integralmolecular.com), scientific communications, Kimberly Mattia is a research scientist II, and Benjamin J. Doranz, Ph.D., is president and CSO at Integral Molecular.